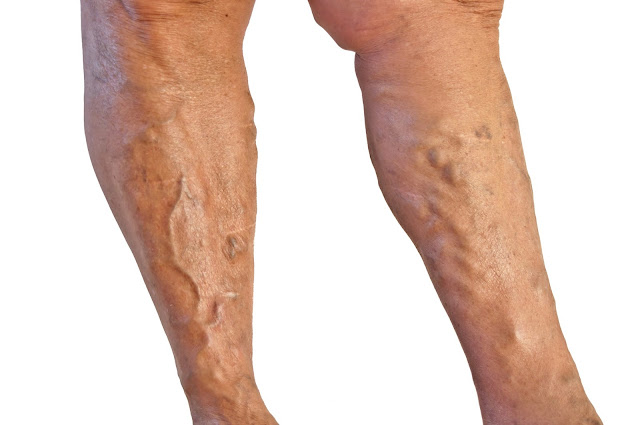 Mostly Varicose Veins are due to the poor circulation which is the improper functioning of the valves within the veins. It is the loss of elasticity of the valves or the dislodging of the valve tissues itself that leads to the accumulation of the blood in the veins. So they are unable to carry the blood towards the heart & the blood flows backwards & accumulates in the veins. This results in swelling & when the blood begins to stagnate in them they turn blue, purple & red. BERRIES: As berries stimulate the formation of capillary veins & strengthening the capillary walls.. Also rich in Vitamin-C, to boost immunity & reduce the blood veins weakness. Has bio-flavonoids , that act like a tonic for the broken capillaries. GINGER: Ginger has the ability to stimulate the blood circulation. By reducing the blood pressure & thinning the blood , it can reduce the visible varicose veins . IF YOU ARE TAKING ANTI-COAGULANT MEDICINES, CONSULT DOCTOR. APPLE CIDER VINEGAR ( ACV ): It stimulates the blood circulation in the affected area. Soak a clean cloth in undiluted ACV & apply on the affected area. Leave it on for 20 minutes. Repeat this 2 times a day for a month or till you get desirable result. You can also consume ACV internally. Mix 1 tsp ACV with 1 glass of normal temp. water & drink before meals. HORSE CHESTNUT: It has the ability to stimulate the peripheral circulation & strengthen the veins & capillary. Apply a horse chestnut ointment or tincture till you get results. It has significant vein tonifying effects & improves lower limb circulation . DANDELLION/PARSELY: Has confirmed diuretic properties easing the symptoms of heavy legs. PINE BAR EXTRACT: A rich source of specific antioxidants that help to protect the capillaries by binding to collagen. CASTOR OIL: Has anti-inflammatory 7 stimulating properties. It stimulates blood circulation & increases the blood flow to the starved tissues. It prevents the blood from clotting in the veins & reduces their swelling. Massage the affected areas with warm castor oil twice a day. VITAMIN K: It improves blood flow to the tissues & prevents discoloration. Include Green Leafy Vegetables, soybeans olives,Dried fruits like blueberries, pears, peaches, figs. LYCOPENE: Antioxidant that protect the cells & tissues from toxic damage. It helps to strengthen the capillaries & veins & to improve the blood flow. If the blood circulation increases , it will not stagnant in the blood vessels & cause further harm. Include tomato, watermelon, guava, papaya,grapefruit, red/ yellow pepper , asparagus, red/ purple cabbage, mango, carrots. MUSTARD OIL: Very good in stimulating the blood circulation & in strengthening the valves. Massage twice a day all the affected areas. LEMON ESSENTIAL OIL: To strengthen the capillary walls in your blood vessels. Mix 2-3 drops of lemon oil with coconut/almond oil. Massage the area few times a day.